Russian olive, black huckleberry, salal: Whether you’re looking for birds, firewood or chanterelles, there’s going to be brush busting involved, and a lot of it’s wet. Patagonia's new Field Hacking Jacket keeps you forging ahead by pairing freedom of movement with excellent protection from moisture and brambles. The tough, stretchy 50% nylon/43% polyester/7% spandex body fabric moves easily, while the waterproof, 2-layer polyester twill on the shoulders and arms shrug off wet foliage and thorns; a DWR (durable water repellent) finish adds another layer of protection from the damp woods. 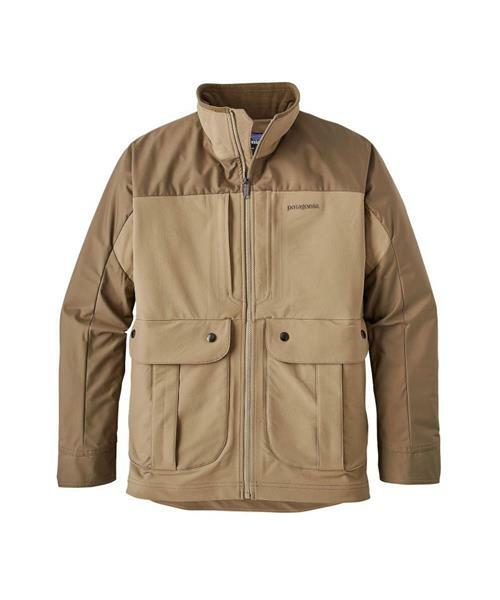 And because days in the field require a variety of gear, the jacket has an ample set of pockets: two zippered vertical chest pockets keep essentials secure; two lower snap-closure cargo pockets expand for more storage; two fleece-lined side-entry pockets offer luxurious refuge for cold hands; and the large, reach-through internal back storage pouch is lined with waterproof/breathable fabric for easy cleaning and features zippered entry on both sides plus a hook-and-loop flap at the top.